My new home office with the big picture windows and the light streaming in come with one downside: it's harder to see my screen. A sensible person would, no doubt, keep the shades drawn when working, or move the office to a nice dim interior room without any windows. But I am not sensible and I love my view of the mountains, the gorge and the birds at the feeders. So accommodations must be made. The biggest problem is finding the mouse cursor. When I first sit down at my machine, I move my mouse wildly around looking for any motion on the screen. 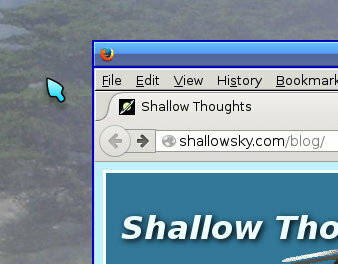 But the default cursors, in X and in most windows, are little subtle black things. They don't show up at all. Sometimes it takes half a minute to figure out where the mouse pointer is. What I really wanted was bigger mouse cursor icons in bright colors that are visible against any background. This is possible, but it isn't documented at all. I did manage to get much better cursors, though different windows use different systems. So I wrote up what I learned. It ended up too long for a blog post, so I put it on a separate page: X Cursor Themes for big and contrasty mouse cursors. It turned out to be fairly complicated. You can replace the existing cursor font, or install new cursor "themes" that many (but not all) apps will honor. You can change theme name and size (if you choose a scalable theme), and some apps will honor that. You have to specify theme and size separately for GTK apps versus other apps. I don't know what KDE/Qt apps do. I still have a lot of unanswered questions. In particular, I was unable to specify a themed cursor for xterm windows, and for non text areas in emacs and firefox, and I'd love to know how to do that. But at least for now, I have a great big contrasty blue mouse cursor that I can easily see, even when I have the shades on the big windows open and the light streaming in.